With a special opportunity to observe faint deep sky objects in August at the San Francisco State field campus at the Sierra Buttes (2200m elevation), I found myself spending several hours exploring one of the most familiar objects in the sky, M31-the great spiral galaxy in Andromeda. Sure, M31 is always worth a look to see its large bright core, immense halo and striking dust lanes, but as we view our galactic neighbor only 12.5° from edge-on we unfortunately miss the stunning spiral arms visible in M51 and the numerous HII regions of M33 seen in a large scope. Jim Shields mentioned to me that he had brought along two issues of Deep Sky (#8 and #32) which discussed in detail the globular and open cluster system of M31 and provided finder charts for tracking down these obscure objects (similar information can be found in Luginbuhl & Skiff's Observing Handbook) and I immediately knew I had an interesting observing project for the week! Edwin Hubble, whose pioneering work on the M31 Cepheid variables led to resolving the debate over the nature of the "spiral nebulae", also published the first catalogue of 140 globulars in 1932. The globulars he found ranged from 15-18 blue photographic magnitude and 4-10 arcseconds in diameter. At 2.2 million light years, the globulars of M31 are roughly 100 times as distant as M13 in Hercules and hence are 1 / 10,000 as luminous if placed at a similar distance. This translates into a ten magnitude difference and at 14.3 (visual) magnitude, the brightest five globulars in M31 are comparable in absolute magnitude to 4th magnitude Omega Centauri (Mv = -8.5), the brightest within our galaxy. As many as 509 globulars in M31 have been catalogued based on spectra plates taken at Mauna Kea with the 3.6 meter Canada-France-Hawaii telescope, (Crampton et al, 1985), although recent work indicates that some of these are faint background galaxies. In any case, the M31 globular cluster system does appear to be more numerous than our own galaxy by roughly a 2:1 ratio. This important article provides identifications, positions, magnitudes, colors and radii although no finder charts are given. As the M31 globulars will appear stellar except for Mayall II, you won't be able to identify the clusters without a good finder chart. Useful photos can be found in the Deep Sky articles as well as Paul Hodge's Atlas of the Andromeda Galaxy which contains 41 large scale photographic charts. These should provide ample ammunition for tracking down the M31 globulars with 10-inch or larger scopes. I found it really quite easy to star hop around in the vicinity of M31 as the star fields are not densely packed and very easy to recognize small asterisms on the photos. In fact, most globulars were picked up by star hopping at low power (x100 for me) with a 20mm Nagler within a minute or two and then the identification was pinned down at x220 with a 9mm Nagler by comparison with a photo. . After three hours working over the field on two nights with my 44cm telescope, I had picked up a dozen globulars as well as five open clusters , three stellar associations and of course the giant star cloud NGC 206. It was also clear that I will have to return to M31 again, as I really just started working on the fainter globulars. All the globular and open clusters appeared stellar (since I was viewing the brighter core), except Mayall II, although the catalogued dimensions are generally 3-4 arcseconds. I found the brightest globulars after Mayall II to be #76, #78 and #280 in Hodge's atlas which had photometrically determined magnitudes of 14.2-14.3V and all were easily visible with direct vision. In some cases, two or more globulars are visible in the same field. As you move closer to the core, the globulars are more difficult to pick out as they are reddened by dust and gas and lose contrast being superimposed on the brighter glow from the galaxy. The fainter globulars I viewed ranged from 15.0-15.5V and required averted vision, though I was able to confirm the sightings after carefully checking the charts. Finally, I also easily tracked down #73, which turns out to be a 15th magnitude stellar globular in M110 = NGC 205, the large companion galaxy northwest of M31. If you are looking for a challenging observing project with a 30cm or larger scopes, this is a great one for the fall as M31 passes high overhead and it was an exciting project to be exploring extragalactic globulars at immense distances. 18" (10/13/07): viewed at 450x and easily resolved the tight triple "star" that contains G1. The mag 13.5-14 globular was clearly nonstellar, though very small, ~8" diameter with a bright, quasi-stellar center and fainter halo. With direct vision the brighter center dominates and the halo fades. The globular forms the east vertex of a tiny equilateral triangle with two mag 14.5/15 stars 8" NW and SW.
18" (12/8/07): at 300x as a very faint mag 15.5-15.8 "star (perhaps slightly easier than listed V mag of 15.8). Located just 2' SW of UGC 330 and 10' ESE of M31-G1. V = 15.5; Size 2.9"
18" (9/20/03): at 323x this stellar M31 globular appeared mag 15.5 or fainter, though could almost hold continuously with averted vision. Located 16' NW of the starcloud NGC 206 and 1.8' E of a mag 14.5 star. Two mag 10.5 stars lie 3' and 4' SE. 18" (12/8/07): extremely faint M31 gc, stellar at 300x. Located just 2' WSW of the center of the large starcloud NGC 206 near the SW end of M31. Required averted vision to pick up but identification confirmed using a photographic finder chart. V = 15.5; Size 2.3"
18" (9/20/03): extremely faint stellar object at 323x requiring averted to identify with certainty, estimate mag 15.5-16. Located 3.5' NE of a mag 10.5 star and 14' due south of the center of M110. V = 15.1; Size 2.3"
17.5" (8/17/93): very faint, visible with direct vision as a mag 15 "star" located 45" SE of a mag 13 star. This object is one of the most remote globulars from the central core and arms of M31 and is situated 20' W of the center of M31 and 20' S of M110. V = 14.9; Size 2.2"
17.5" (10/30/99): this M31 globular appears a mag 15 star located 1.5' WSW of mag 12.5 star. There is a 1' pair of mag 12.5 stars situated 5' S which is nearly collinear with the globular. V = 14.2; Size 3.2"
17.5" (10/30/99): easily identified as a mag 14.5 "star" 2.0' following a mag 12.5 star which forms a 1' pair with a similar star due south. Appeared slightly "soft" compared to nearby stars though not resolved with certainty. M31-G72 is located 5.4' NNW. V = 14.3; Size 3.6"
18" (12/8/07): relatively bright mag 14.3 "star" within a "W" or Cassiopeia shaped asterism. At 300x, this M31 gc has a soft appearance with a small, hazy halo with averted vision 2"-3" diameter. With direct vision a brighter stellar "core" dominates and the halo shrinks. Coincidentally, the orientation of the constellation Cassiopeia in the sky was very similar at the time of the observation. A mag 14-14.5 star lies 22" SSE. Located 10' SE of NGC 206 near the SW end of M31. C107 is located 6' W.
V = 15.6; Size 2.9"
17.5" (8/26/00): this extremely faint M31 globular (15.6V) was not seen at 220x but picked up at 280x. Forms the eastern vertex of a small right triangle with a mag 13 star due W and a mag 14 star to the SW. Located 17' WNW of the core of M32. V = 15.5; Size 2.7"
17.5" (8/26/00): this mag 15.5 globular in M31 appeared extremely faint at 280x but easier than M31-G87 situated just 3' NW. V = 15.0; Size 2.7"
18" (12/8/07): this M31 gc was picked up at 225x as a faint mag 14.8-15 "star". The location was easy to track down using a photographic finder chart as it's located 6' NNW of mag 7 HD 3914 and 10' SW of M32. At 300x it appeared to have a very small halo, ~2" diameter in comparison to nearby faint stars. V = 15.7; Size 2.3"
18" (9/20/03): at 323x this difficult 16th magnitude M31 globular required averted to glimpse and was only visible intermittently. Located just west of a line with two mag 10.7/11.3 GSC stars 3' NE and 6' NE. Slightly brighter M31-G150 lies 5' NE. V = 15.2; Size 2.9"
18" (9/20/03): extremely difficult observation as this M31 globular is situated only 5' SW of the center of the core of M31! Glimpsed several times at the correct position. A few other very faint stars (not plotted on the GSC) in the vicinity were also glimpsed intermittently. V = 15.5; Size 2.8"
18" (9/20/03): this extremely faint M31 globular required averted vision and could not hold continuously. Located 2' N of a pair of mag 12.5/13 stars. The observation is hampered by the bright background glow of M31. Located 10' NW of the center of M32 and just 16' SSW of the center of M31! More difficult G144 is located 13' N near the core itself. V = 15.4; Size 2.7"
18" (9/20/03): at 323x had some difficulty acquiring, but once identified was visible nearly continuously. Estimate mag 15.6, although probably more difficult due to background glow of M31. Located 1.5' W of a mag 10.7 GSC star and 2' NE of a mag 11.3 GSC star. V = 15.6; Size 2.5"
18" (12/8/07): at 300x, appears as a mag 15.5 "star" just 1' W of a mag 9.5 star and 6' NNW of the center of M32. V = 15.3; Size 2.4"
17.5" (8/26/00): very faint, stellar, mag 15-15.5. This M31 globular forms the south vertex of an equilateral triangle with mag 10.5 and 12.5 stars ~2.5' NW and NE. Located 12' N of the core of M32 and 13' S of the core of M31. V = 14.7; Size 2.5"
18" (11/13/07): relatively bright M31 globular (V = 14.7) situated just 1' W of a mag 11.5 star. Easily picked up at 225x though located just 10' SE of the center of M31 and barely off the east edge of the main portion of the halo. At 450x, G213 appears quasi-stellar with a tiny fuzzy disc perhaps 2"-3" in diameter. With direct vision a stellar nucleus is sometimes visible or the very small halo simply fades out. 17.5" (1/12/02): picked up at 220x as a very faint mag 15 "star", possibly quasi-stellar. At 380x, appears as barely nonstellar glow, ~2" in diameter. Easily visible at this power. V = 15.3; Size 3.2"
18" (12/10/07): very faint mag 15 "star" on the east side of the core (8' from the nucleus) and collinear with two mag 12 stars 1' WNW and 2' WNW. At 220x has a "softer" appearance than nearby faint stars and seems to have a 1.5" to 2" disc. G235 lies 2.4' ESE. V = 15.0; Size 3.4"
18" (12/10/07): faint mag 15 "star" close NE of the core of M31. This globular is l ocated just south of a group of stars superimposed on M31 that makes a good reference and forms the south vertex of an isosceles triangle with two mag 10.5-11 stars 1.8' NW and 2' NE. A slightly brighter star is 1.4' further south and initially I mistook this star as G229. V = 15.4; Size 2.9"
18" (12/10/07): difficult mag 15.5 "star" located 2.8' NNE of G222. Only visible 15-20% of the time at 260x in soft seeing but observation repeatable in the same position. Should be an easier object in good seeing conditions. V = 15.5; Size 3.8"
17.5" (9/28/02): extremely faint, threshold globular in M31 at 324x. Located 43" SE of a mag 12.3 star. Seemed fainter than listed V magnitude of 15.4, although transparency was mediocre. V = 15.4; Size 2.6"
18" (11/13/07): very faint M31 globular, appears stellar and close to mag 15.5. Situated 1.2' SE of a mag 11-11.5 star and 4.3' ENE of G213. This globular is located 12' SE of the center of M31 just along the eastern edge of the disc. The field is peppered with numerous mag 11-12 stars and an equal mag double star lies 3.5' due north. V = 15.5; Size 2.5"
18" (12/10/07): appears as a very faint mag 15 "star". Located 2.3' SE of G222 and collinear with G222 and two stars 1' and 2' further WNW of G222. At 220x, these two objects are similar in brightness and have a softer appearance is comparison to nearby faint stars (perhaps 1.5"-2" in diameter). V = 15.3; Size 2.6"
17.5" (8/18/93): extremely faint, appears as a mag 15.5 "star". Cannot hold continuously but easy to locate just 1.5' S of distinctive line of three equally spaced mag 13 stars of 2' length. Located along the W side of the NE extension of M31 and 5' NW of a mag 9 star. V = 15.1; Size 3.2"
17.5" (8/18/93): very faint, although listed as V = 15.0. Fairly difficult as superimposed on obvious haze of M31. Can just hold steadily with averted vision. This M31 globular cluster is located at the NE edge of the core and 4' S of mag 9 SAO 36609. V = 15.5; Size 3.1"
18" (12/10/07): extremely faint mag 15.5 "star", but position confirmed at 260x (7.5mm Tak LE). Requires averted vision and some patience in fairly poor seeing. Located 1.6' ENE of a mag 11 star. V = 14.8; Size 3.4"
18" (11/13/07): this M31 globular appears as a mag 14.8 star situated just 1.3' SE of a mag 11 star and 3.6' SW of G280 and is one of the brightest GC's in M31. V = 14.2; Size 2.7"
18" (11/13/07): appears as a relatively bright mag 14.3 star at 225x. This globular has a soft appearance at 450x with a very small fuzzy disc ~2" diameter. On a line to the SW is the elongated cluster M31-C410 (1.2' SE) and M31-G272 3.7' SW. Located 20' ENE of the center of M31 along the east edge of the NE flank. V = 15.5; Size 4.9"
18" (12/10/07): very faint, mag 15-15.5 "star" that is easy pinpoint as it's located at the midpoint of two mag 12 stars oriented WSW-ENE and separated by 1.6'. A string of star associations (A40/41/42) is close following. V = 15.7; Size 2.5"
18" (11/13/07): appears as an extremely faint mag 15.7 "star". Verified though required averted to initially pick up using 300x. Easier to view at 450x. Located 1.9' ESE of a mag 11 star. This star forms the SW vertex of a bright trapezoid with three other mag 9-11.5 stars. V = 15.8; Size 2.2"
17.5" (9/28/02): marginal 16th magnitude globular in M31 located 2.5' WSW of a mag 13/14 double in the NE portion of the outer halo. Only glimpsed occasionally at 324x. V = 15.2; Size 2.5"
17.5" (9/28/02): faint, stellar. This is a fairly easy mag 15.2 globular located 6' SSW of mag 9.1 SAO 36631 and collinear with mag 12 and 13 stars 5' and 6' NE. V = 15.6; Size 2.2"
17.5" (9/28/02): identified at 324x as a very faint, stellar mag 15.6 globular at the NE end of M31. Located 47" NW of a mag 13.5 star. V = 15.1; Size 5.7"
18" (12/8/07): faint but easily visible non-stellar M31 cluster at 300x. Appears very small, ~10"x5", elongated ~N-S and could be mistaken for a distant, faint galaxy. Located 8' due south of the starcloud NGC 206 and forms a right angle with G76 5.5' E.
18" (12/10/07): not initially noticed at 220x, but with careful averted vision I could pick up a very low surface brightness spot, ~20" in diameter with no concentration. Slightly easier at 260x and visible ~50% of the time with averted. The core of this object was catalogued as an emission-line object and is listed in SIMBAD as MLA 285. 17.5" (8/17/93): faint, extremely small, about 6" diameter. Easily visible as the slightly fainter southern member of a very close nebulous pair with M31-C203 15" N. Just cleanly resolved at 220x. Located SW of the core of M31 and 9' NW of M32 within association M31-A24. 17.5" (8/17/93): faint, extremely small but nonstellar, about 6" diameter. Easily seen as the slightly brighter northern member of a very close nebulous pair with M31-C202 15" S, just resolved at 220x. A mag 9.3 star lies 5' E. Located SW of the core of M31 and involved in association M31-A24. 18" (11/13/07): this unusual M31 "cluster" appeared a faint, elongated glow nearly 3:1 N-S, ~20"x8". Situated in the middle between the relatively bright globular G280 1.2' NE and G272 2.4' SW. C410 is the brightest object with the association A33. 18" (11/13/07): appears a small, hazy patch, ~15" diameter. Located just south of a 50" pair of mag 12 stars. Consists of clusters C284, C285 and C286. 18" (12/8/07): very faint hazy glow, small, 15"-20" diameter. Requires averted to see due to low surface brightness, but can nearly hold steadily with averted vision and concentration. One or two extremely faint stars or stellar M31 clusters are involved. 18" (12/8/07): marginal low surface brightness glow involved along the south side of a group of mag 13-14 "stars", ~30" diameter but very ill defined. It's possible the mag 13-14 stars that I noted are stellar cores of clusters, but are more likely Milky Way stars. 17.5" (8/17/93): extremely faint, very small, elongated glow requiring averted. Located 2' N of a line connecting two mag 12/13 stars oriented WNW-ESE with separation 6'. Situated along the eastern edge of the NE extension and close to the sharp light cut-off of M31 with the background sky to the E. Probably glimpsed the unresolved glow of C311, C312, C313 with a total length of 1.5'. Fairly faint, fairly large, elongated 5:2 north-south, 4.0'x1.6', low and uneven surface brightness, a few very faint stars are just visible over the surface including a brighter star at the south tip, located over 1° southwest of the core of M31. This object is a huge star cloud in M31. *	Hodge, P.; 'The Andromeda Galaxy', Kluwer Academic Publishers, 1992. 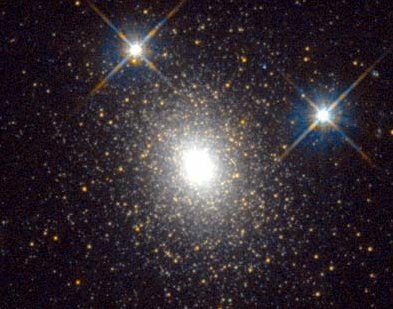 *	Higgins, D.; 'The M31 Globular Cluster System', Deep Sky No. 32, Fall 1990. *	Luginbuhl, C. and Skiff, B; Observing Handbook and Catalogue of Deep-Sky Objects, Cambridge University Press, 1989. *	Crampton, D., Cowley, A., Schade, D., and Chayer, P.; Astrophysical Journal, 228, 494, 1985. *	Skiff, B.; 'All About M31', Deep Sky No. 8, Fall 1984. *	Hodge, P.; 'Atlas of the Andromeda Galaxy', University of Washington Press, 1981. *	Hubble, E.; Astrophysical Journal, 76, 44, 1932.